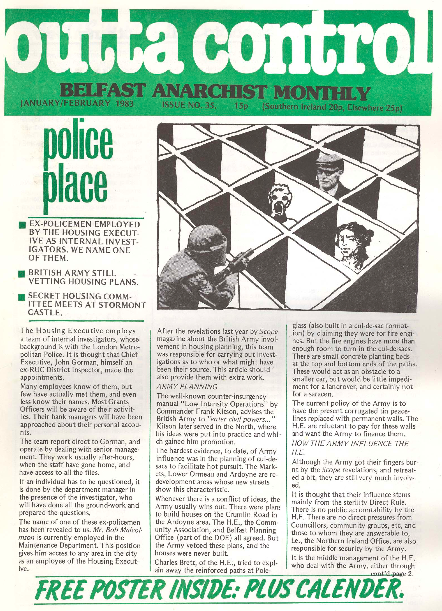 The cover story tells of how the British Army were able to veto the building of new houses on Belfast’s Crumlin Road, despite the Housing Executive, the Planning Office, and the local community association all being in favour of the development. It goes on to report that Housing Executive managers were holding regular meetings with the Army, and that Belfast Development Officer John Steel had been photographed in military uniform during a visit by the Queen to Hillsborough Castle. Their Dublin correspondent details the fatal shooting – in the back of the neck and while unarmed – of Eamon Byrne. Byrne was a known robber whose life had previously been threatened by Gardai. Other stories look at Northern Ireland Electricity’s heartless treatment of families in debt; plastic bullets; the Shoot-To-Kill policy of the RUC and British Army which saw seven unarmed men killed in an eight week period; and how the punk band Crass and 50 friends occupied a disused music venue in London, repelled the police and gave a free concert to 1,500 fans. 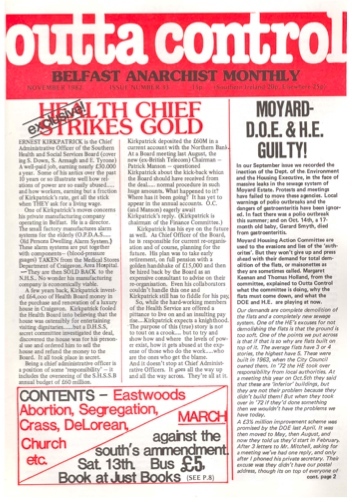 Outta Control was a monthly bulletin from the Belfast Anarchist Collective who published 42 issues from 1980 to 1984. The first issue was titled Self-Control, after much joking that the title seemed more appropriate to an anti-masturbation tract, it was changed to Outta Control from no.2 onwards. The BAC also ran a bookshop, Just Books, at 7 Winetavern Street (where the Castlecourt Shopping Centre now stands). The shop opened in June 1978 and finally closed 16 years later in June 1994. 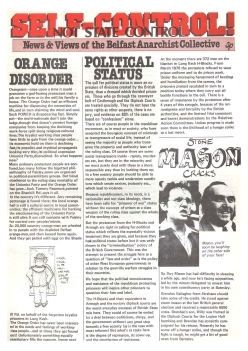 Contents of this issue include the republican prison struggle in the H-Blocks, the court case for conjugal rights taken by anarchist prisoners Marie and Noel Murray, and a piece accusing local punk-pop band Stiff Little Fingers of “selling out” because they signed to a major record label.